A few days ago, the successful dry docking of aerial refuelling probe with mother tanker was carried out on September 4 and 6, 2018. With this, India joins the elite group of countries who have developed the Air-to-Air Refueling (AAR) system for a military class of aircraft, says Mr R Madhavan, CMD, HAL. The LCA Tejas has successfully completed the Wet (actual) engagement on Monday. 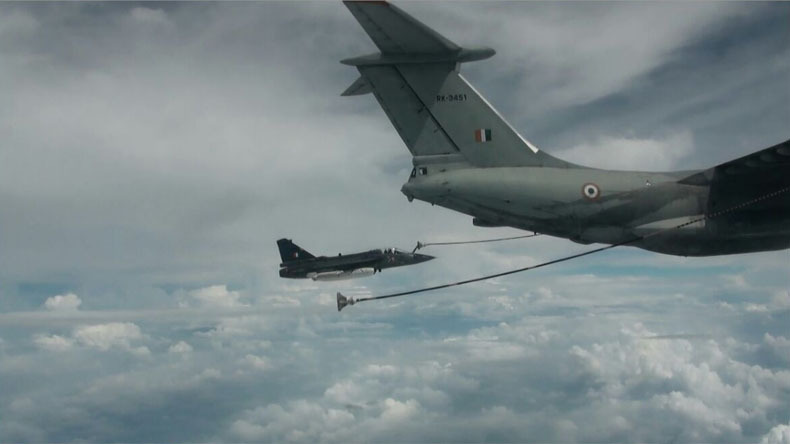 The Light Combat Aircraft (Tejas LSP-8) has successfully completed the Wet (actual) engagement on Monday by transferring 1,900 Kgs fuel from IAF IL78 mid-air refuelling tanker. The refuelling was carried out at an altitude of 20,000 ft. The aircraft speed was 270 knots and all the internal tanks and drop tanks were refuelled. Piloted by Wg Cdr Siddarth Singh of NFTC, this significant milestone was achieved on Monday at 0930 hrs with designers from HAL and ADA closely monitoring the system parameters from the ground station at Gwalior. The performance of aircraft systems (mainly Fuel & Flight controls systems) during the trial were in-line with the design requirements and was closely matching with the results of extensive ground tests of air-to-air refuelling system.